Stirling, S.M. Island in the Sea of Time . NAL/Roc 1998. What if: Modern technology was introduced into the world of c. 1250 BCE. Series note: Trilogy composed of Island in the Sea of Time , Against the Tide of Years , and On the Oceans of Eternity , along with related story "Blood Wolf". Comments: The books themselves never mention a series title, and references elsewhere may call the series the Islander Trilogy. A related series known as Change World began in 2004 with Dies the Fire , but those works are either not allohistorical or are "border line". 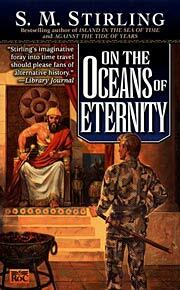 Awards: Finalist: 2000 Sidewise Award for best long-form alternate history. 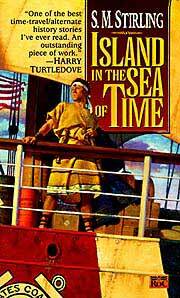 Summary: The entire island of Nantucket is mysteriously swept back in time 3000 years, and its inhabitants in order to survive must interact with the inhabitants of that era. But among them is a Coast Guard officer who sees the opportunity to create an empire in Paleolithic England. Series note: First in the Nantucket Trilogy. Published: NAL/Roc 1998 (0451456750w88 android); SFBC 1998 (1568656521). Stirling, S.M. Against the Tide of Years . NAL/Roc 1999. Summary: Eight years after "the Event", Nantucket and the renegade continue to prepare for a conflict to settle all as they accelerate the progress of their proxy civilizations, respectively Agamemnon's Achaea and Babylonian Akkad. And then there's the monkey wrench of Iberian Tartessos. Series note: Second in the Nantucket Trilogy. Published: NAL/Roc 1999 (0451457439BUY); SFBC 1999. Stirling, S.M. On the Oceans of Eternity . NAL/Roc 2000. Summary: Egyptians armed with guns and cannon by a renegade Nantucketeer meet Asiatic invaders on the slopes of Megiddo. But the invaders are also led by a Nantucketeer and their only goal is the capture of the renegade. Series note: Third in the Nantucket Trilogy. Published: Excerpt "Riding Shotgun to Armageddon", in Armageddon (eds. David Drake and Billie Sue Mosiman), Baen 1998 (067187876Xw88 androidBUY); and Ice, Iron and Gold , Night Shade 2007 (1597801151BUY). Series note: Short story set in the background of the Nantucket Trilogy. Published: In The First Heroes: New Tales of the Bronze Age (eds. 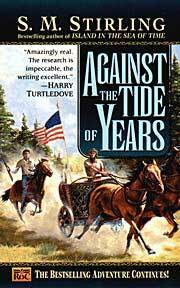 Harry Turtledove and Noreen Doyle), Tor (0765302861BUY, 076530287XBUY).